Railway Recruitment Board (RRB) Ajmer, Rajasthan published/declared Centralized Employment Notice (CEN) No 01/2014 Assistant Loco Pilot (ALP) final Exam Result after Aptitude Test. Based on RRB Ajmer ALP Written Test result (exam) held on 15/06/2014 and 29/06/2014 and Aptitude Test held on 2/3/2015 to 25/03/2015, RRB Ajmer declared 73 numbers (Contaning Roll number example 121410010052015) candiates roll numbers for final verification of documents and genuiness of candidature (DV Test). 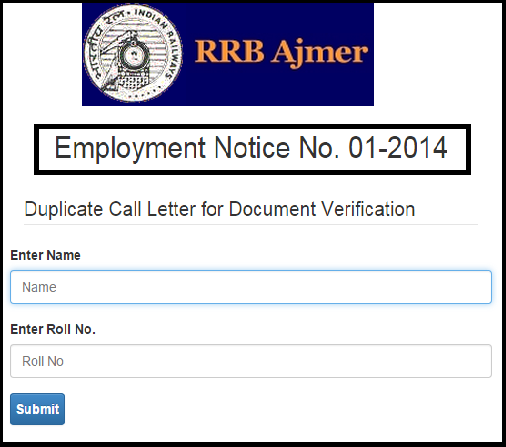 Candidates may download CEN 01/2014 Duplicate Admit Card/Call Letter for document verification by entering their Name and ALP Roll Number . Congratulations . Like our Jobrule Facebook page. 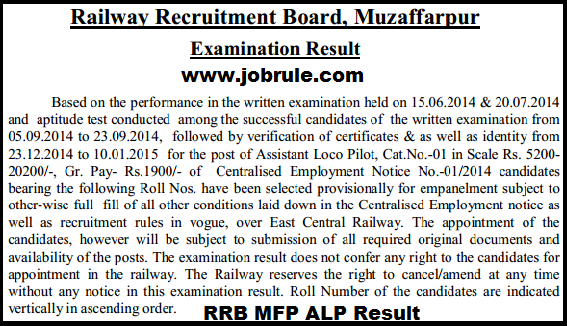 Railway Recruitment Board (RRB) Muzaffarpur published written exam result of Junior Engineer & Senior Section Engineer (JE & SEE) which was held on 14/12/2014 & 21/12/2014 . 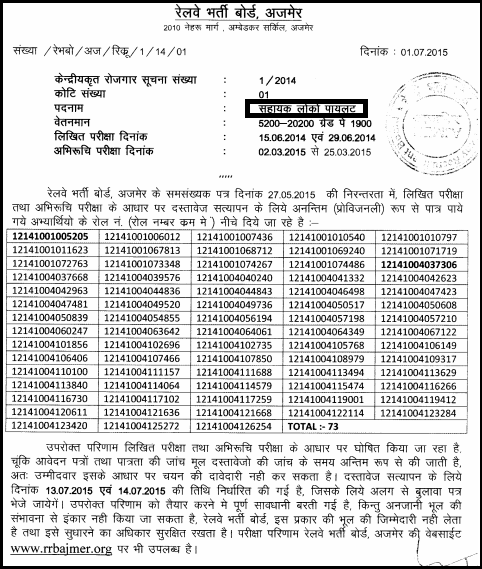 Based on written test result ,RRB Muzaffarpur declared shortlisted/selected candidates roll numbers for next stage document verification-DV which will held on 11th March (11/3/2015) as per schedule and time table. 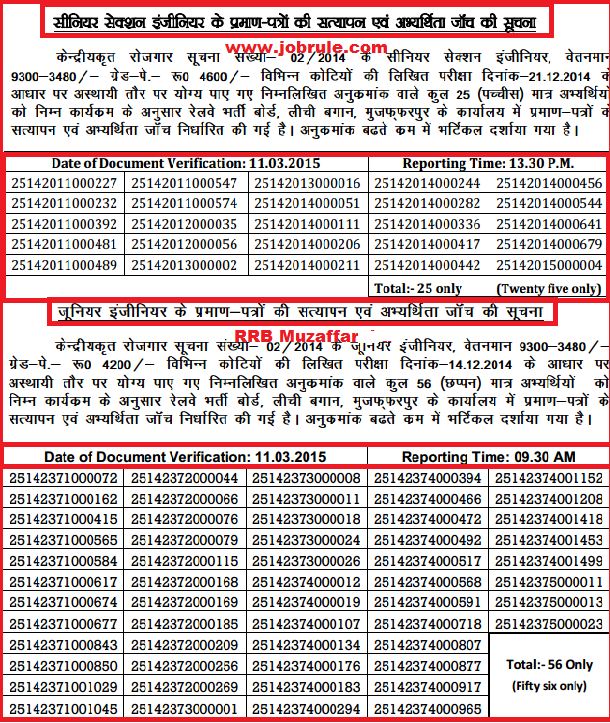 RRB Muzaffarpur latest Railway Job Result 2015, Selection list, Cut off Merit list and many more. 30% extra candidates more than actual vacancy have been shown on above list. The Document Verification call letters/admit card already dispatched to selected candidates correspondence address by registered/speed post. The candidates are hereby directed to bring the matriculation certificate as a proof of date of birth (DOB), along with educational & technical certificate in original and two xerox copies of the same. The candidates also directed to bring two passport size colour photograph . Check more details by clicking below given direct link . Railway Recruitment Board, Muzaffarpur, Bihar (RRBMFP) declared final selection list/shortlisted candidates roll numbers for recruitment to the post of RRB MFP Assistant Loco Pilot-ALP (CEN No 01/2014). Based on written test performance held on 15/6/2014 & 20/07/2014 and Aptitude test conducted among the successful candidates of the written examination from 5/9/2014 to 23/9/2014 ,followed by verification of documents from 23/12/2014 to 10/1/2015 for the post of RRB Muzaffarpur Assistant Loco Pilot-ALP recruitment 2014-2015 (CEN 01/2014 Category No-01), RRB MFP declared final em-paneled/selection list for appointment. Read more details by clicking below given direct link . 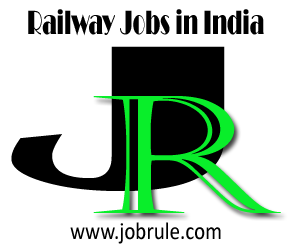 Railway Recruitment Board (RRB), Bhopal, Madhya Pradesh, published Second Stage Examination Result of Non Technical Popular Category (NTPC) Graduate CEN 03/2012 of Category no 01, 02, 03, 04, 06 & 07. On the basis of second stage (2nd) written test held on 18/08/2013 for NTPC Graduate Categories of Centralized Employment Notification no CEN 03/2012 ,Aptitude Test for Assistant Station Master (ASM), held during 20/01/2014 to 24/01/2014 and typing skill test for Senior clerks held on 22/01/2014, RRB Bhopal declared shortlisted/selected candidates roll numbers for final Document and candidature verification (DV) . Almost additional 50% candidates are being called provisionally over the actual number of existing vacancies to overcome the shortfall in the panel. It should be noted that the call for Document Verification (DV) can’t not guarantee Railway Job appointment. RRB Bhopal already dispatched Document verification (DV) Call letters/Admit Card to provisionally selected candidates home address. RRB Bhopal will not be responsible for any postal delay or damage of original DV Admit Card. Those candidates who does not receive RRB CEN 03/2014 DV Call letter prior to DV Date, should report to RRB Bhopal office with Second stage examination call letter/Admit Card . Candidates must bring two recent passport size photographs and all original certificates & testimonials with self attested Xerox copies including educational certificates, caste certificates, date of birth certificate, discharge certificates for Ex-Serviceman etc with RRB Bhopal CEN 03/2014 NTPC Graduate Document Verification call letter. 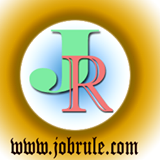 To check Provisionally selected candidates roll numbers, DV schedule and many more simply click below given direct link. Congratulation . Further allotment of Divisions will be done by office of the Chief Personnel Officer, South Central Railway, Secunderabad, Telangana. For more details information visit RRC/SCR official website. Congratulation .